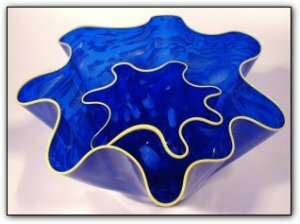 This set of two fluted bowls have mixed shades of blue with a bight yellow liprwap. The contrast of the bright and vivid yellow on top of the deep rich blue stimulate the eyes while still remaining subtle. While these bowls look fantastic as a set with the smaller bowl set inside the larger bowl, they look equally fantastic as a matching set side by side.